Browse: Home / Commix v1.5 – Automatic All-in-One OS Command Injection and Exploitation Tool. 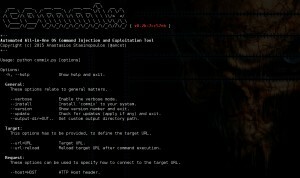 Commix v1.5 – Automatic All-in-One OS Command Injection and Exploitation Tool. * Fixed: Minor improvement in the “ICMP exfiltration” module. * Fixed: Minor improvement for choosing default value when pressing enter. * Added: New tamper script “hexencode.py” that encodes the payload to hex format. * Fixed: Minor improvements in executed commands history. * Added: New verbosity level (4) for printing the HTTP response page content. * Added: New option “-t” for logging all HTTP traffic into a textual file. * Added: New option “–msf-path” for specifying a path where metasploit is installed. * Added: New verbosity level (3) for printing the HTTP response headers. * Added: New verbosity level (2) for printing the performed HTTP requests headers. * Added: Support on crawler for checking target for the existence of ‘sitemap.xml’. * Revised: The payload for Ruby reverse-shell has been shortly revised. * Added: Support for bind TCP shell (via “bind_tcp” option). * Added: New option “–crawl” (1,2) for crawling of a given website, starting from the target url. * Updated: The Unicorn tool has been updated to version 2.3.5. * Added: The project’s official URL has been added in the menu banner. * Fixed: Minor improvements in tab completion. * Fixed: Minor improvement in the function that checks for updates on start up. * Fixed: Minor improvements in enumeration options (added failure messages). ← VENOM 1.0.12 Codename: Black Mamba – metasploit Shellcode generator/compiller.